The excitement continues this week as Rio Grande Games has released a slew of new games. 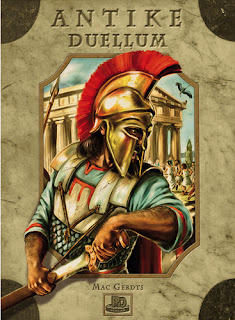 One of the new games out from Rio Grande Games is Antike Duellum, a 2-player strategy game with a 2-sided board that provides a chose of 2 scenarios. Choose to play as the Carthaginians battling the Romans on one side or as the Greeks fighting the Persians on the reverse side. Both players lead an ancient civilization. Each player starts with 3 cities, which produce marble, iron, and gold respectively. These resources are used to develop the civilizations, i.e. erecting temples, building town walls, developing technologies, and recruiting and arming military units. Players expand their territories by founding new cities or conquering their opponents' cities. All of the above actions are key in strengthening your nation and in acquiring the favor of personages. Their are 5 types of personages - kings, citizens, scholars, generals, and navigators with respective special requirements. The first player to achieve the favor of 9 personages wins the game. 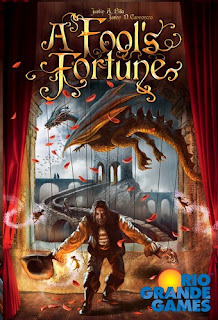 Another new game from Rio Grande Games is A Fool's Fortune, a 2- player card game where players race to make sets in the tradition of Rummy, but with several wily twists. The game consists of 77 unique cards featuring 5 suits of Fortunes and a host of talented Characters. Characters can be recruited into a player's services, but of course for a fee. A Fool's Fortune has 3 levels of play, called Acts - Act I ~ the Page's Game, Act II ~ the Baron's Game, and Act III ~ the Master's Game. Character abilities are fully unmasked and the game takes on a new dimension. Players will need a crafty mind and cunning strategies to take full advantage of the options available. A third new game from Rio Grande Games is Tzolk'in: The Mayan Calendar, a dynamic worker placement game that presents a new game mechanism. 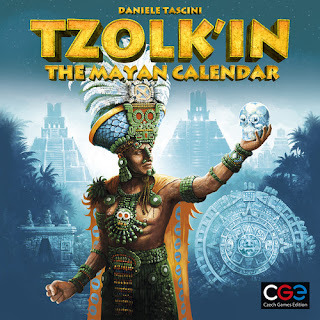 The game board features a Mayan calendar represented by a 26-tooth Tzolk'in gear connected to 5 smaller gears representing 5 locations where Mayan civilizations developed. Players take on the roles of Mayan tribes. The board depicts various actions that can benefit your tribe. On a turn players will either place workers on the gears or pick up workers placed on a previous turn. Actions consists of producing food, extracting resources, constructing buildings, and developing technologies. Some actions please the gods, while others may displease them. Players track their standings with the gods on the temple boards. While the gods award victory points only twice during the game, there are other ways to score victory points. There are many paths to victory. The game ends after 1 full revolution of the central Tzolk'in gear. Resources are cashed in and the player with the most victory points wins. 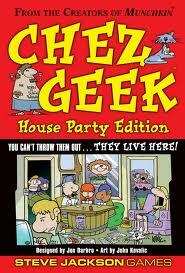 Also in this week is another classic card game from Steve Jackson Games, Chez Geek - House Party Edition. Beer. Nookie. Roommates. It's another Friday night at Chez Geek. Set up house with your friends – for as long as you can stand them. Get a job – they're all bad. Spend money and your precious spare time to accumulate Slack points. Drink cheap booze, hang out at the cafe, and play with the cats. Do unto your roomies before they do unto you. What other game gives you points for sleeping?Just remember, when your roommate and his S.O. keep you up all night: You can't throw them out. They live here.